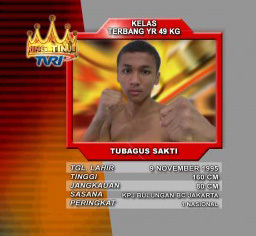 Tubagus Sakti—who died in hospital after a boxing match in Indonesia in Jan ’13. Last month, the issue of when a referee should stop a fight was highlighted after an incident at a boxing event in Jakarta, Indonesia, in which 17-year-old Indonesian boxer Tubagus Sakti collapsed and suffered convulsions moments after his eighth round TKO defeat to opponent Ical Tobida. After the event, it was suggested that the referee was at fault for failing to stop the fight at an earlier point during the contest. Ical had been able to land more than one clean shot after Tubagus had stopped defending himself before the referee finally intervened and ended the match. However, it is impossible to pinpoint the damaging blow(s) to the young boxer—cerebral haemorrhage can develop minutes, hours or days after head trauma—and we will probably never know if quicker intervention by the referee could have made any difference to the young man’s life. Although I do not personally think the referee should be held accountable for this tragic event, the incident emphasizes that the referee’s position is one of responsibility. He or she must use judgement to determine if—or at which point—a fight should be stopped to protect a contestant. While a premature stoppage could make for frustrated boxers and spectators, too late a stoppage can have implications on the health and safety of one of the competitors. 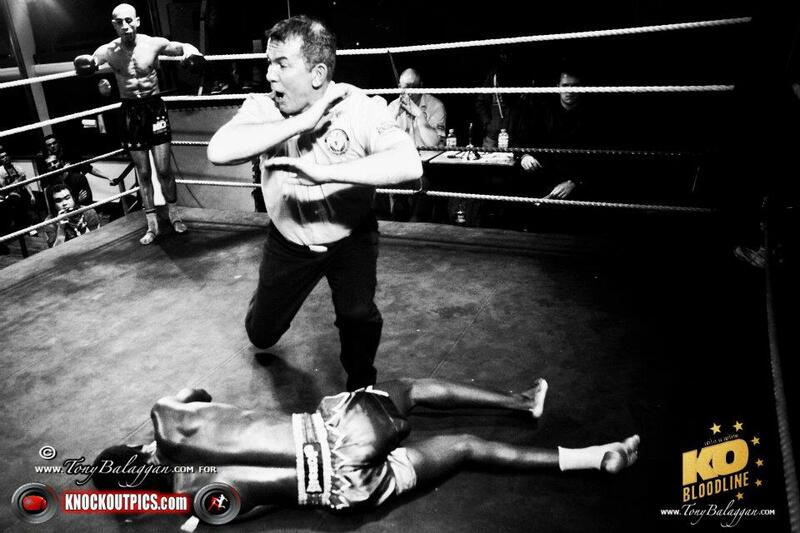 I have noticed that in Muay Thai promotions in Thailand, referees tend to be less likely to stop fights than referees in Western countries, and will often let the action flow despite a boxer being cut and drenched in blood, or having suffered one or two knockdowns. I wonder if the gamblers might have had an influence on this trend. The power of the gamblers in modern Muay Thai is a subject well-discussed (see Muaythai Journal Episode 6 for some of Rob Cox’s opinions on the issue). At the major stadiums, the gamblers typically form the largest—and most vocal—section of the crowd, and it has been suggested that Muay Thai could not survive as a spectator sport without their presence at events. Is it possible their influence stretches as far as the refereeing aspects of the sport? After all, an overly cautious referee with a tendency to interrupt contests prematurely could end up facing a backlash from disgruntled gamblers, who enjoy placing bets throughout a bout as the action develops. 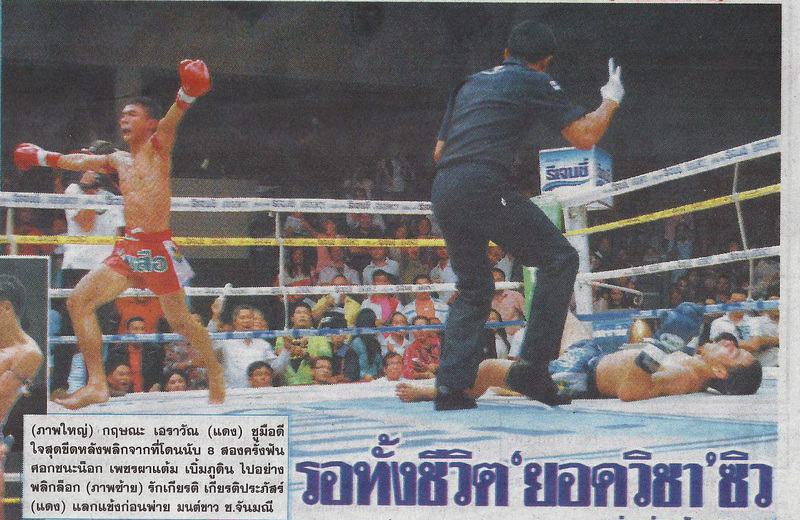 Of course, the positive aspect of Thai referees’ willingness to allow fights to proceed is being able to experience some thrilling bouts, particularly those in which the boxer who initially appears to be losing shows heart and makes a comeback. Last Sunday, I was lucky to have been in the crowd at Channel 7 Boxing Stadium for one of the most spectacular comebacks in a fight I have ever witnessed. The match was the second bout of the afternoon, between Kritsana Erawan (red) and Petpataem Bermpudin (blue). After a typically cautious first round, Petpataem scored a knockdown in round 2 after landing a solid right hook to the head of Kritsana. Kritsana was given an 8 count by the referee and Petpataem was celebratory. Following the count, he pummelled more punches into Kritsana, knocking him down a second time. Kritsana was then handed a second count by the referee. When the action resumed, Petpataem punched hell-for-leather—his fists swinging relentlessly. For several seconds the attacks were one-way traffic. Kritsana was covering up but being rocked from side to side as shots flew in from left and right directions. At this point the gambling odds were quoted as 40-1 in Petpataem’s favour, and it is possible that another referee might have stopped the contest at this stage to “save” Kritsana from further punishment. However, the referee in the ring gave Kritsana the opportunity to fight back by refraining from ending the match. And fight back he did—willed on by the crowd as his every effort was cheered uproariously. As his head slowly cleared and Petpataem began to tire, he began throwing the odd kick, knee and some vicious-looking elbows. Finally one of those elbows hit the target and Petpataem went down before being counted out. The bout was one of those fights I feel privileged to have been in the live audience for. While watching fights in the standing area at Channel 7 Boxing Stadium might not be the most comfortable of viewing experiences, the atmosphere there—especially when fights such as this one unfold—is truly electrifying. Thankfully, the referee that day showed good judgement regarding the timing of a fight stoppage and we were granted the opportunity to watch this fantastic bout. Watch and enjoy. …I would love it if you could write a post about exactly how betting during fights at major Muay Thai stadiums is done. I’ve never seen anyone be able, or seldom even try to, explain the process itself. How the bets are placed, how odds change and are communicated throughout the fight, the process of “injection” which Todd Kellstein mentioned in his film Buffalo Girls. The way betting is done has a big impact on how fights unfold are fought, but who has talked about this? It would be a great article. Serge Trefeu wrote this article in 2010. I’ve had that request before for an article on the gambling system. I do have a basic understanding of how the gambling works (the source for those odds was the write up in Muay Siam by the way) but my knowledge is way too limited to write a full explanatory piece on the subject. I would really have to pester Mr. Somboon (the Eminent Air boss and a keen gambler) for information! By “injection”, I think Todd Kellstein was maybe referring to “ad chiit”, when a gambler(s) will offer a boxer extra money mid-fight if they can turn it around and win. …speaking of which, what do you think of that strike scoring breakdown in the article? Accurate to your sense? I’ve definitely seen it happen at Lumpini when a gambler signals/shouts to the corner from the stands and you can see them gesturing the value of the offered amount. Very often I’ve seen one of the guys in the corner when the Eminent Air boxers fight has a phone headphone in their ear for communication with someone. I’m pretty sure it’s regarding the gambling though could also sometimes be for communication with Mr. Somboon (who doesn’t always attend the fights). I have seen some huge wads of notes being passed around for gambling on the boxers. I’m very Western and don’t like to ask too many questions about money though! I didn’t totally agree with the strike scoring breakdown in that article but I think it’s very difficult to describe the system. I don’t believe they actually count the strikes (or even score the rounds individually) anyway – it’s more of a score for the overall fight. re: the scoring, Melissa that is what I’ve come to believe (and now experience) having come through the Tony Myers seminar video which changed my view of Muay Thai. But the author is very specific in that article, even suggesting that stadiums are well-known for scoring rounds and fights differently. He must have gotten those descriptions from somewhere as it doesn’t seem like something to invent. Maybe it is an amalgam of the Tony Myers “whole fight” equilibrium approach, and individual scoring differences? So interesting. I’m wondering why Tubagus Sakti died in this boxing match? It didn’t seem overly brutal. Did he have prior problems entering the fight ? Fights like this make me second guess fighting all the time. I’ve read your other article about head trauma and saw that being on a motor bike posses more possibility of risk.from your background on the brain can you please shed some more light on this issue and what can one do to best proving this. I tried to find out if there were any updates on the reasons for Tubagus Sakti’s death. However, a google search was unfruitful – all I could find was the previous information about his cerebral haemorrhage and some discussion on the subject on http://www.reddit.com. I guess his death can only be put down as an extremely rare and tragic incident and we will never really know why he suffered the loss of life in the ring when so many others would remain unscathed. As for your question on motor biking, I should have linked to the reference and now can’t seem to locate it! It was a statistical report on head trauma associated with different sports and activities though I can’t remember if the figures were in numbers of cases per year or a percentage of people who perform the activity. It was my first article on this blog – in future I will be more careful to link to my references. I’m glad you responded and it was helpful. I’d like to go to Thai land and train and possibly compete. But septical about medical care , per fight screening , match ups, and judging and thought on this ? You should write a blog on this topic I know I’m not the only one curious what its all about. Hey, that’s a great idea for a blog post! In Thailand, medical care is first-class at the international hospitals but you have to pay, of course. I would advise you to get insurance – it always surprises the number of people who come to Thailand and don’t even invest in basic travel insurance. Although it’s likely you won’t experience any major health problems or injuries you just never know, so it’s worth having that back-up. Pre-fight screening…..well, the most extensive check I ever had was a quick listen to my heart beat using a stethoscope! Match ups and judging…like in any country you can have good and bad experiences. But I wouldn’t worry too much about such aspects. You have so much to gain from training in Thailand – not just fitness and techniques but amazing life experiences too. It’s tragic that somebody died in the ring, but it’s really very rare. I’ve had worse injuries from rugby than I ever had from boxing. The worst concussion I had was from a kick in the head with a studded rugby boot. I guess he had some sort of congenital abnormality that escaped detection (though I’d guess that Thai boxers don’t get such thorough checkups before they compete as happens in the west). The only way that I can see to avoid this sort of accident altogether is to stay at home wrapped in cushions and then you’d die early of obesity and diabetes. Let’s face it, the whole attraction of boxing is that it is a bit dangerous. When two people decide that they want to test each other’s courage and endurance to their limits, it’s their choice and they know the risks. They are doing it because of the risks, not despite the risks. The same applies to stoppages. Nobody wants to be stopped prematurely, while there is still a chance you might come back, In MMA, I believe it’s stopped only when you can no longer intelligently defend yourself. and that makes sense to me. Nobody expects to get out of the ring without a few cuts and bruises, and you are only their because you want to find out what you can take without quitting. Your video shows that very well. That’s something that people who aren’t into combat sports find quite hard to understand. But for those who love the sports, it’s what makes their day. Haha, I totally agree. The element of risk is part of the reason we love combat sports. I was disappointed to hear about some negativity associated with Rosi Sexton’s most recent fight. Rosi is a remarkable athlete and representative of women’s MMA. From what I saw of her fight she did obviously take a lot of punches but was always trying to defend herself and attack when possible; it was a good call not to stop the fight or throw in the towel. Respect to her for having the guts to get in the ring and for showing such heart. That’s just brilliant. She’s the one that was in there, and if she wanted to continue, and the doc thought it was OK, then that’s fine. In fact she came back hard in the final round and for a moment I thought she might KO Andrade. It was certainly a hard fight. because there were so few take-downs, so it was almost like three 5 min rounds of boxing with 4 oz gloves. But her spirit was indomitable. Like you, I think the call was right, but what really matters is that she thought it was right.